Understanding computer technology is not for the faint of heart. After all, computers are complex, multifaceted, integral, and technological cipher and calculating machines. Indeed, to fully understand a computer, you need a computer. Yet, there are ways to simplify it and understand computer technology. 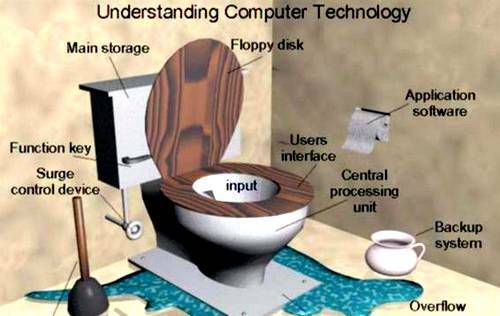 And since a picture is worth 1000 words, the following illustration may be most helpful and you seek to understand your computer. Do you understand your computer now? Do you fully comprehend all the parts that work together to make it function? Can you now see why you need a CPU, a Central Processing Unit? And why the Backup System so critical? And the difference between the Main Storage, and Floppy Disk storage? And then there's input and output. And RAM. And ROM. And CD's. And eternet and WiFi. Yet it can still be hard to understand my computer. Hardware and software. Computers are confusing. 14 inch monitors, 15 inch monitors, 17 inch monitors, 19 inch monitors, then flat screens, and wide screens. Like it says above, "a picture is worth 1000 words." "My friends think I'm a computer genius for always fixing their computers. Actually, I'm just really better at using Google than they are." "Computers make very fast, very accurate mistakes!" "Every time you call Tech Support, sadly, a kitten dies." "Pro-gram-mer: (n) an organism that turns caffeine into computer software code." "Al-go-rith-im: (n) a specialized word used by computer programmers when they don't want you to know exactly what they did." "A clean house is the sign of a broken computer."